New Delhi: A massive fire swept through a four-floor hotel in central Delhi’s Karol Bagh in the early hours of Tuesday, killing at least 17 guests, including two people who jumped off the building in a desperate bid to save themselves. Some used fire extinguishers were found, suggesting people trapped inside tried to douse the flames in a bid to escape. But escape may have been almost impossible. • The Delhi Police arrested the general manager and a manager of Hotel Arpit Palace. The hotel’s general manager, Rajender, and manager, Vikas, have been arrested for culpable homicide, DCP (central) Mandeep Singh Randhawa said. The hotel owner, Shardendu Goel, is absconding after the incident, he said. Randhawa said the case has been transferred to the Crime Branch. • The fifth floor of ‘Hotel Arpit Palace’ was as being used as a rooftop restaurant which was “unauthorised”, according to officials. The fifth floor was sealed with a brick wall after which a fire safety certificate was issued, officials said and indicated that later the wall was demolished to run the rooftop restaurant. • Officials said the fifth floor was shaded with acrylic roof and being used as a terrace restaurant by the hotel management and added that kitchen and chairs were found by them during the fire fighting and cooling operations. • The fire safety certificate was issued only for basement being used as storage, ground floor which was used for a restaurant and reception, first and second floor having 12 guest rooms each, third and fourth floor having 11 guest rooms each. • The Delhi Police has registered an FIR against the management of Hotel Arpit Palace. The case has been registered under sector section 304 (culpable homicide not amounting to murder) and 308 (attempt to commit culpable homicide) of the Indian Penal Code. Conviction under both the sections leads to seven years of imprisonment. 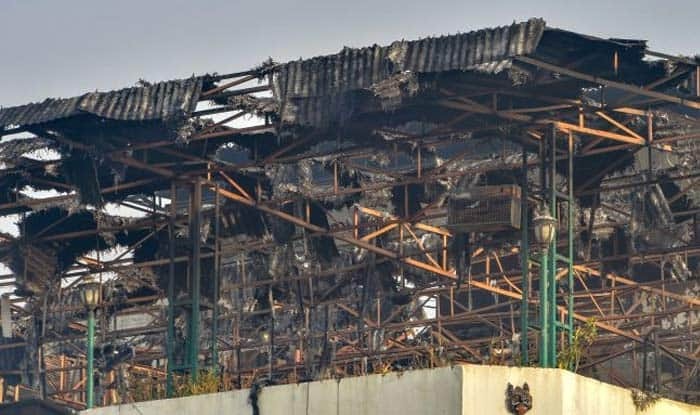 • Indicating violation of civic norms including running a makeshift restaurant on the rooftop, municipal officials have ordered a probe into the fire incident. • Suggesting that a short-circuit may have led to the incident, North Delhi Municipal Corporation (NDMC) officials said as per the records, the building had faced “intermittent partial demolition” or other civic action under the Delhi Municipal Corporation Act from mid-June 1993 to January 1994, for unauthorised constructions. • Union minister K J Alphons Tuesday said the emergency exit of the hotel was “too narrow” and also locked. The minister said he was sure that there would be violation of norms. The Union tourism minister said there were a lot of wooden structures inside, which may have helped the fire spread. • A fire department official said some used fire extinguishers were found, suggesting people trapped inside tried to douse the flames in a bid to escape. • Former Delhi chief minister Sheila Dikshit expressed her grief over the incident. “I express my sorrow at the tragic death of several innocent people in a fire at #ArpitHotel in #KarolBagh. Our brave firefighters are working amidst extremely difficult circumstances to rescue those who are stranded in the building,” she tweeted.